View your account balance, statements, rewards, and more. Introducing a line of feature-packed, low-APR credit cards designed to give you convenient purchasing power backed by the local, award-winning customer service only City Bank can deliver. From robust rewards to lower APRs for those who revolve credit, one of our credit cards will be the perfect fit. Big reward options for everyday spenders. Looking for more information about rewards or how to redeem your rewards? Learn more by clicking the link below. City Bank Mastercard Credit Cards have some added benefits worth noting. With great features and benefits, customers can turn good deals into great ones by adding value to purchases large and small with convenience, protection and more. Welcome to a faster, safer, more convenient way to pay. If you find a lower price within 60 days of purchase Price Protection guarantees you the best price on products purchased with an eligible card by refunding the difference. Pays for covered damages to the rental vehicle when the eligible Mastercard card is used to initiate and pay for the entire rental transaction. To take advantage of any of these features or file a claim, simply call 1-800-Mastercard. 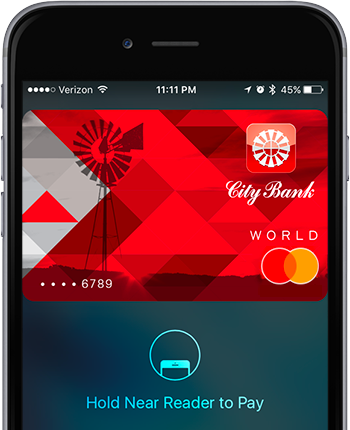 Paying with your City Bank Mastercard credit card in stores or within apps has never been easier. Our credit cards are supported by Apple Pay, the mobile payment and digital wallet service by Apple® that lets users make payments using compatible iPhones, Apple Watch, and certain iPads. Intro Offer 0% Intro APR on Purchases and Balance Transfers for 6 months. Then a variable rate, currently 11.24% - 19.24% applies, based on creditworthiness. 5,000 bonus points upon $1,000 spend in first 3 months. 10,000 bonus points upon $3,000 spend in first 3 months. Apply now for your low APR personal credit card. Start earning robust rewards and take advantage of a low APR personal credit card today. It's perfect plastic backed by impeccable customer service. Questions about your credit card? 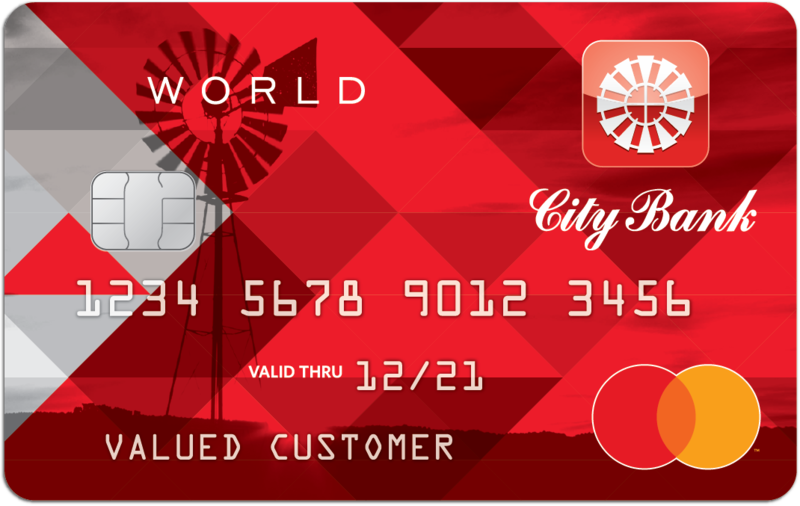 Contact City Bank Customer Service at (800) 687-2265 or Card Member Services at (877) 768-1355. MasterCard® is a registered trademark of MasterCard International Incorporated. *The descriptions of the listed benefits and enhancements are summaries only. Certain terms, conditions and exclusions apply. The information is provided on an “AS IS” basis and for informational purposes. It is not a specific recommendation for any particular action or investment and should not be relied upon in whole or in part as the basis for decision making or other purposes.